Night & Day Cafe emerged in 1991 and is now one of the main protagonists in the Manchester music scene. The venue has become a major hub to some of city’s musical giants and is used ontour routes by artists across the world. Having played host to over tens of thousands of musicians during its 20+ year span in all genre’s from indie to folk, jazz to electronica, the Night & Day has hosted stars such as; Arctic accutane online in uk Monkeys, MGMT and Mumford & Sons on their rise to the top of the music hierarchy. The day time see’s the music venue stick to its chip shop roots by serving impeccable tasting food as well as a mass selection of hot and cold beverages in a nice, friendly environment. 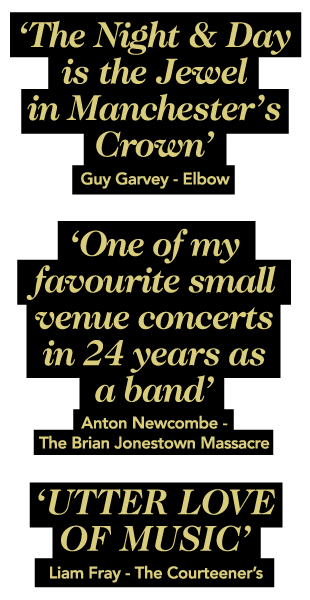 Still the local haunt of the established Manchester superstars such as Guy Garvey, Johnny Marr and Liam Fray, you can on occasion see the talent of the new generation such as M O N E Y wondering the hallways. You can find Night & Day Cafe located in Manchester’s trendy Northern Quarter. The venue boasts a state of the art P.A/front of house system, friendly staff, great food and a dedicated promotion team.